Let us help! Sign up for our free VIP Training! 1. Live Chat: Real time response during business hours 9 a.m.-5 p.m. EST we offer a live chat from the home page. You can join SpellingClassroom.com for free. We have both free and premium content on our site. 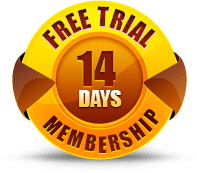 When you become a member (free) you will automatically start as a premium membership with a 14 day trial which requires no financial information. When your 14-day trial expires you’ll continue to have access to the free content on our site. Being a premium member allows members access to our premium content. Yes. All memberships have a 30 Day Money Back guarantee. You can try before you buy with our 14 day membership trial which requires no financial information. Company Name: Synergy1 Group, Inc.
Do you have a spelling placement test? Our program is set up by grade, we encourage students to start at their grade level and if it’s too challenging students can go back one year. How is SpellingClassroom different from Spelling City? SpellingClassroom is unique from other spelling programs in many ways. Click here to view a summary of our unique features. I only have one student, do you have a one student package? If you are a parent using the program for your children we have recently added an individual student package plan. The Family package is meant for 1 to 5 students. If you have a family larger than 5, you can add individual seats to the package. What about the BigIQkids Spelling+Vocabulary program? We have phased BigIQkids and replaced it with SpellingClassroom.com. SpellingClassroom.com is the new and improved BigIQkids spelling & vocabulary program. We have many new features on the new site! At school, students are required to advance as a group, but with SpellingClassroom, your child has the ability to govern their own progress and excel at their own pace. The program provides student’s with continual progress cues how how they are doing and what to do next. Students have an up-to-date visual snapshot of how they’re doing via their Course Summary page. Is SpellingClassroom aligned with Common Core State Standards? Keeping in mind Common Core State Standards (CCSS) is not a curriculum but a set of standards. SpellingClassroom.com is a resource that supports CCSS initiatives such as foundational reading skills, writing, language arts and cross curricular learning. 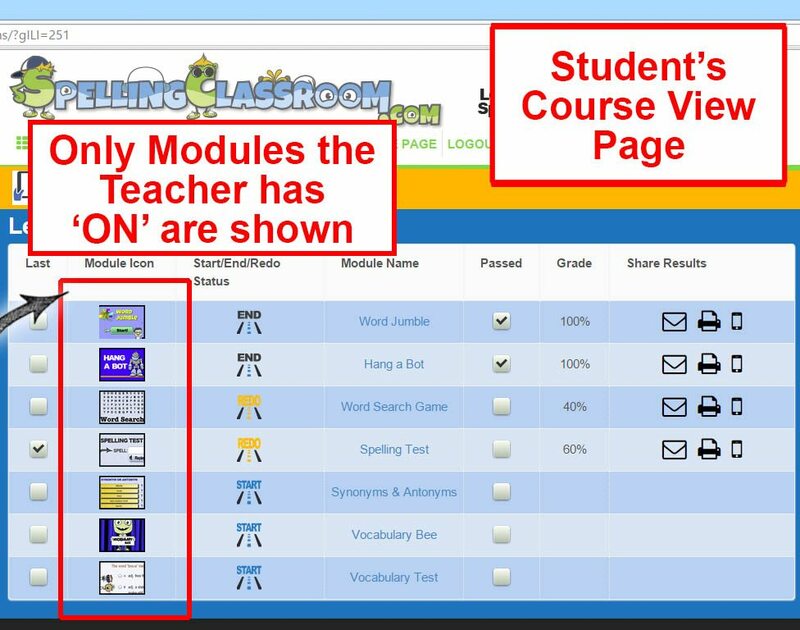 Why do you include all learning modules for both a spelling & vocabulary list? As a default, all modules are turned on and accessible for all word lists. Our average student spends one week on a word list. We feel anytime a student is learning a word regardless which list is comes from we want our students to master all components of each word (both the word’s spelling and meaning). For example, after a student works on a spelling list for a week we want them to not only master the spelling of each word on their list but also know the word’s definition, synonyms, antonyms and be able to use the word in a sentence. This is our recommendation but we add the flexibility via the teacher’s account to turn off any module a teacher does not want their students to access. Do you have a letter to send home to parents? You can find the letter in your teacher’s account ‘Settings’ tab. No. Our program is set up by grade, we encourage students to start at their grade level and if it’s too challenging students can go back one year. SpellingClassroom – CAN USE THE LIVE SITE for iPads. Our live site (www.spellingclassroom.com) works on iPads, you do not need an Apple App to run our program on Apple Mobile or tablet devices. Go to our SpellingClassroom.com Get Started page. Do you have guidelines on how to use the program? Please find our general guidelines below. Students do not need to complete EVERY lesson in the order we provide but we do want students to spend at least 10-25 minutes a day on the program. Daily practice helps with long term retention and good study habits! Students should be completing enough lessons during the week that they successfully pass the spelling & vocabulary tests. Students generally spend one week mastering one word list. If the student fails any lesson (below a 70%) they should redo it. Student should not move to the NEXT word list until they successfully pass the Spelling Test & Vocabulary Test with a score of 100%. If your student does not enjoy a spelling lesson (for example: HangABot lesson) then they can skip it. Students should take a Spelling Test via the Pen & Paper Spelling Test module. Teachers/parents need to grade this test manually. Students should do the Spelling Quiz as this helps with standardized testing. Students should do ALL the vocabulary lessons (except the crossword puzzle, this module is optional) as each vocabulary lesson focuses on something different. The WRITING section is optional. If your student already has a lot of writing reinforcement in their curriculum this section can be skipped all together. For our Tricky 450! Word lists, we highly recommend students take the mid-term and final. How do my students earn game coins? One game coin is earned with each passed lesson (70% or greater). Only one game coin is given per lesson, per word list. If students retake a passed lesson (let’s say the student initially scored 80%) and the student retakes this lesson and scores a 88% or 100%, the student WILL NOT receive another game coin. The student already earned a game coin the 1st time he/she played this lesson and passed it. If the student initially failed the lesson and then retakes the lesson and passes, the student will be rewarded with one game coin. The reason we only give ONE game coin per passed lesson per word list is because we do not want students playing easy lesson over and over again just to earn game coins. 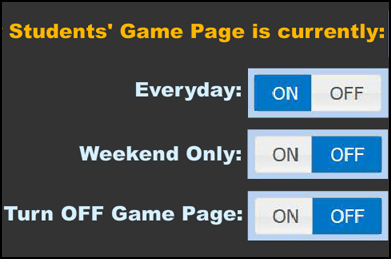 Teachers have the options of turning the Game Page on/off or to weekends only. How do my students in different grades/levels find their word lists? When you have students in different grades/levels you’ll need to use the word list ‘Groups’ function when creating word lists. For example: If you have a 1st grade student and a 2nd grade student in your classroom. 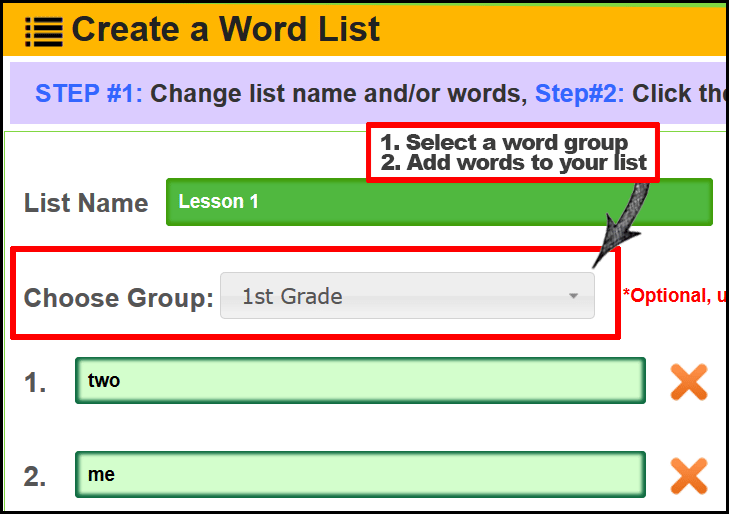 When you create your word lists you’ll assign all the 1st graders word lists to the ‘1st grade’ Word List Group. 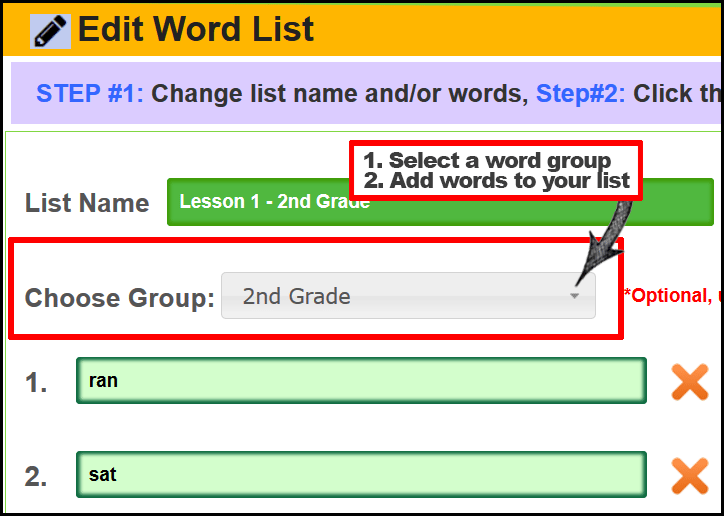 You’ll assign all the 2nd grade word lists to the ‘2nd grade’ Word List Group. If you already created a word list, you can easily edit an existing word list. To edit a word list you go to your word list page and select it with the edit icon then select a word group. When your student logs they’ll see their word list group and click on the group that apply to them to select their word list. 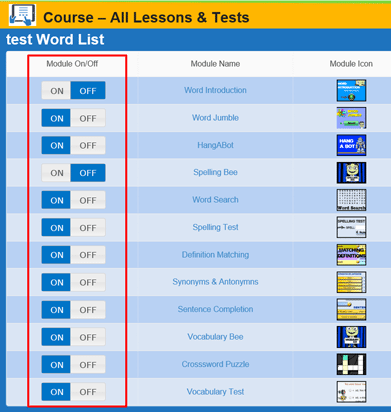 After the student completes their 1st lesson, the word list page will automatically open to their last word list completed so they won’t have to keep selecting their word list group. You should always leave a message for your students on which ‘Group’ and which ‘Word List’ you would like your students to work on. 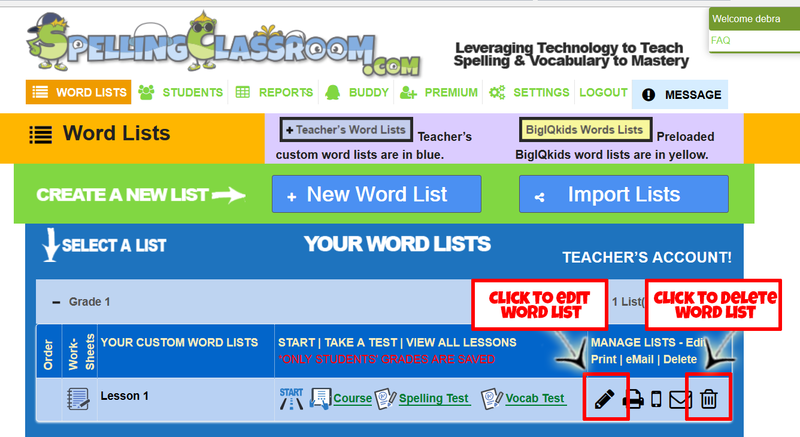 How do my students use Spelling Classroom preloaded word lists? 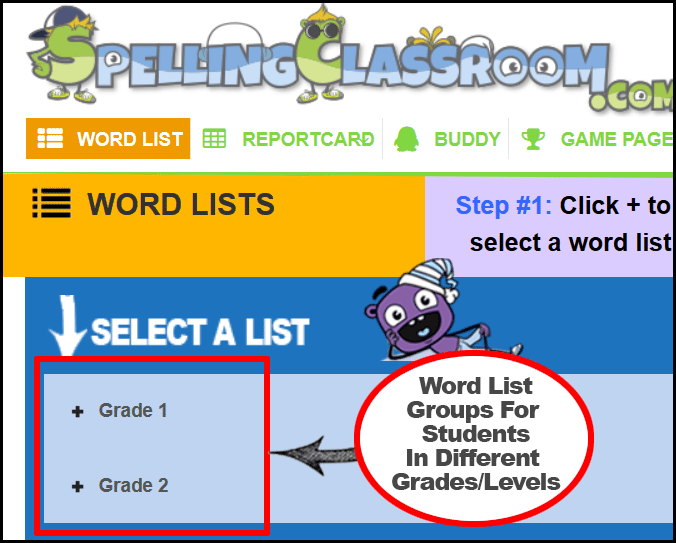 If you are using Spelling Classroom word lists there is nothing you need to do for your students to see the Spelling Classroom word lists as your account comes preloaded with Spelling Classroom word lists. Just leave the Spelling Classroom word lists on ‘Enable’ in your teacher’s account and your students will automatically see the Spelling Classroom word lists. 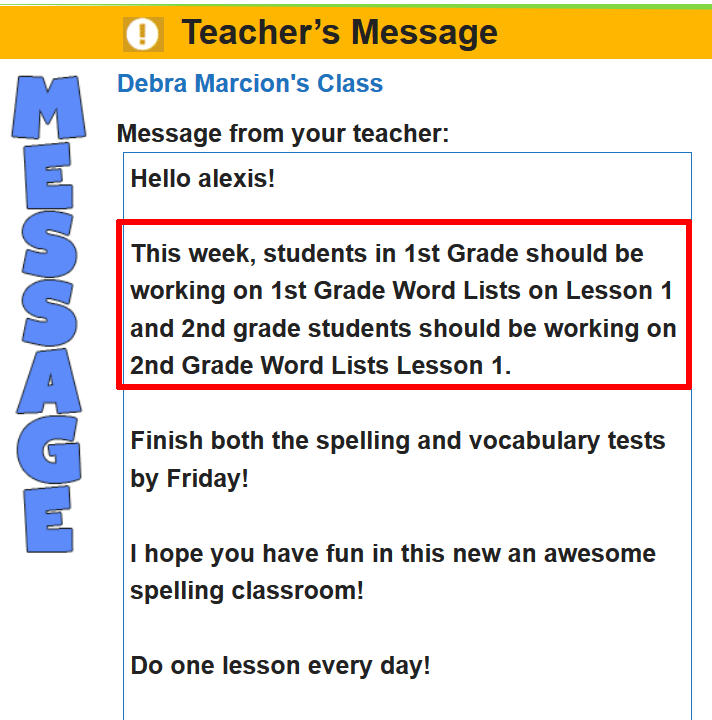 You’ll need to instruct your students on your Message page on which Spelling Classroom word list you would like your students to work on. For example: “This week you are working on Spelling 1st Grade Lesson 1”. Once your student completes their first word list the program will automatically open the word list to the last word list the student completed. 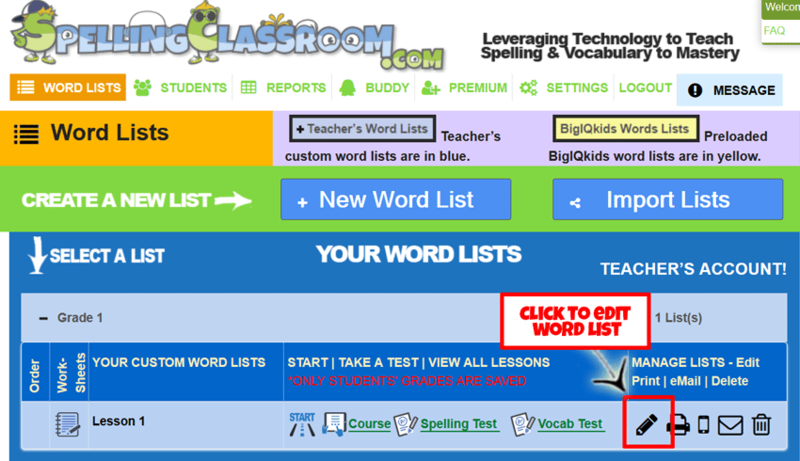 Students will not have to select word list groups again as their word list page will automatically open up to the last word list group worked on. How do I create, edit, delete a custom word lists? You can create/edit/delete word lists from your word list page. To create a word list, click on the ‘New Word List’ button on top of the word list page. To edit or delete a word list, click on the edit or delete icon in the word list’s row. Can I turn on/off lessons and tests? Yes. 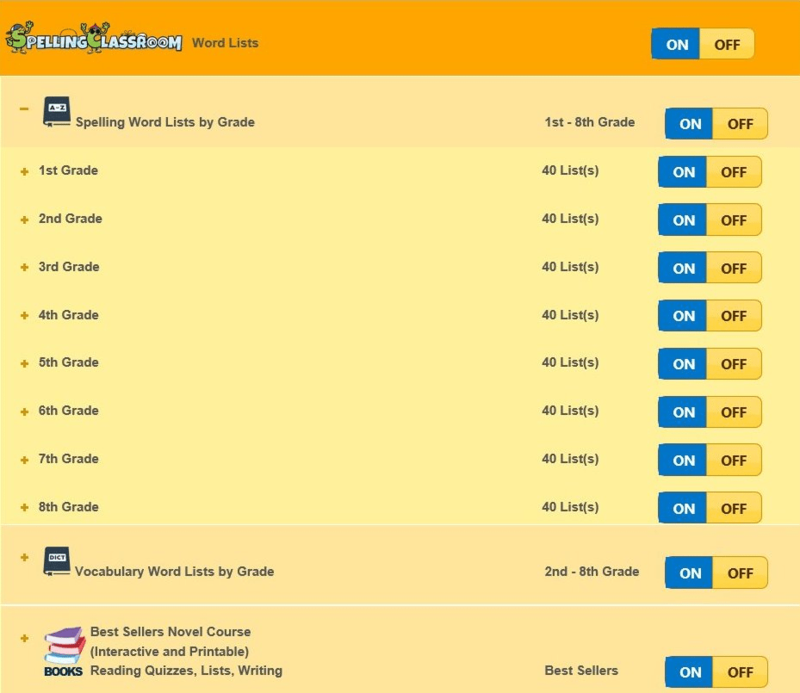 SpellingClassroom is very customizable! You can easily turn modules on/off by logging into your teacher’s account and at your word list page click on the “Course Overview’ Module. Here you can turn on/off any modules. When you turn a module ‘OFF’ it will not been seen in your students account AND it applies to ALL word lists. I don't understand how turning modules on/off works with the Course View page? There is a teacher ‘Course View’ page and a student ‘Course View’ page for every word lists. 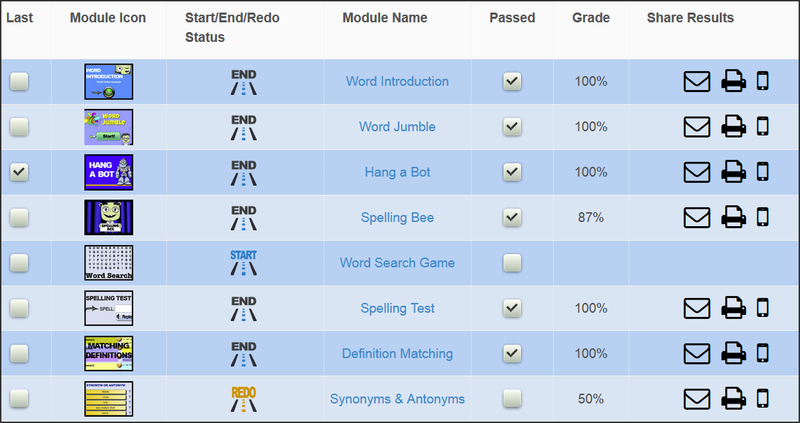 The ‘Student’s Course View’ page provides students with a snapshot of their word list progress. The ‘Course View’ page also allows access to modules (lessons/tests). 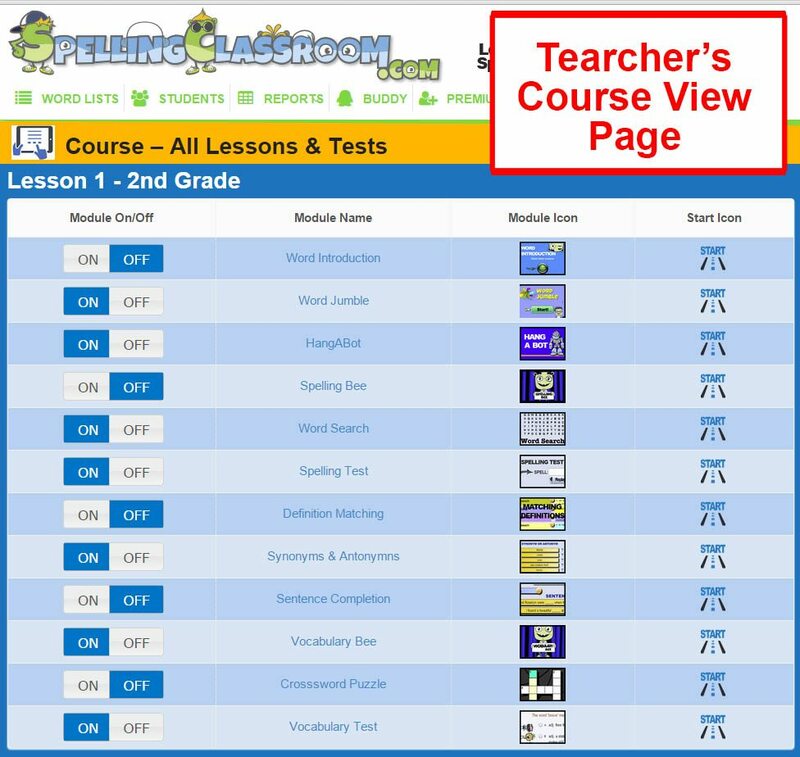 When a teacher turns modules ‘OFF’ on their Teacher’s Course View’ page they will remove all ‘OFF’ modules from being shown to their students. Below an example of a ‘Teacher’s Course View’ and ‘Student’s Course View’ pages to show you the difference. In this example, the teacher has turned ‘OFF’ 5 modules. Turning modules on/off also effects the student’s side navigation during active lesson/test pages. This is what the student’s side navigation would like for this example. How do I grade my student's writing assignments? Step #1: Log into your teacher account. Step #2: Click on the “Course Overview” for the word list you would like to grade submitted writing assignments. 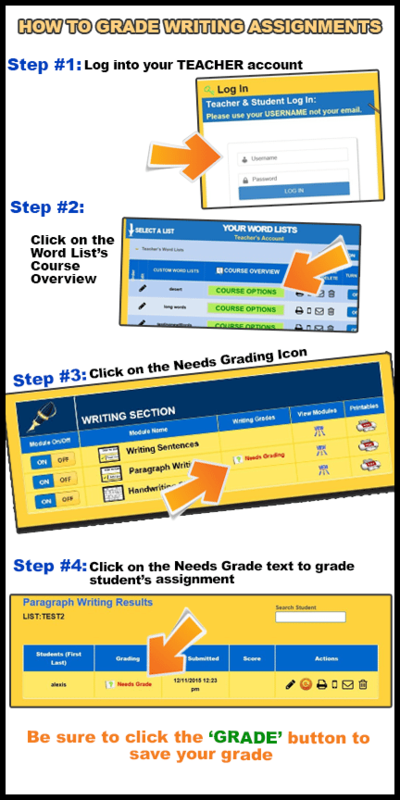 Step #3: Click on the ‘Needs Grading’ Icon to go view student’s submitted papers. Step #4: Click on the ‘Needs Grade’ text to grade each student’s submitted paper. Step $5: Click on the ‘GRADE’ button to save your grade. Please view the attached pic for instructions. How do students save their writing lesson? Step #1: Log into your student’s account. Step #2: Click on the “Course Overview” for the word list you would like to work on for a writing assignment. In this example we are working on the Sentence Writing lesson. Step #3: Add as many sentences as you can and click on the ‘SAVE’ button if you need to save your work. You can click on the resume button on your next visit to pick up where you left off. Please view the attached pic to view the save button. Can I turn the Game Page off? Yes. Log into your teacher’s account and click on ‘Settings’ on the top navigation buttons. Once on your Settings Page, click on the ‘Game Page Setting’ button. It’s on the teacher’s Game Page that teachers can set the Game Page for their students to On, Off or Weekends Only. Can I import a list from another member? Yes. Log into your teacher’s account and on your Word List page click on the ‘Import Word Lists’ button. You can select which word lists you would like to import from another member. How do I start a membership? You will first need to create an account to start your membership via the ‘Sign Up!’ button (top of the page). Once you have an account, log in and click on MEMBERSHIP (top of the page). We also offer a 14 day trial and require no financial information to try our membership.